Nothing will give you more fun in the sand, dirt, snow, or mud than the Trail Finder 2. Part scale truck, part adventurer, your TF2 is ready for your mud kicking trail-loving lifestyle! The TF2 has both detailed styling and aggressive performance. You will find a balance of capability and performance built into every TF2. Performance of the TF2 is smooth and with its 2 speed selectable transmission, 4WD drivetrain, bullet-proof transfer case and quality metal components throughout. The TF2 is truly a work of art in both appearance and performance. Every TF2 is compatible with a full range of option and performance parts designed to enhance the performance and add to the scale look of the only true scale 1/10 offroad truck... Custom Designed for True-to-Scale Looks Realistic Billet Aluminum Ladder Frame Chassis 2 Speed Remote Selectable Transmission Center Mounted Realistic 4x4 Transfer Case Cast Metal Axles with Locked Differentials True to Scale Leaf Spring Suspension Highly Detailed Body with Dropped Bed and More 1.55 Stamped Steel Beadlock Wheels with Lug Nuts Super Grip High Performance Mud Thrasher Tires Realistic Tube Bumpers - Rock Rails - Skid Plate. All New Hammer Transfer Case Ratio - 1.47:1 Gears - Wide 32P steel gears Features - 8 bearings, cast casing, hardened gears All New R3 2 Speed Transmission Ratios Pinion/spur 14/64 = 4.57:1 1st gear 3.47:1 2nd gear 1.27:1 Gears - Wide steel 32P, Delrin spur, slipper clutch, Features - Machined billet aluminum casing, scale looking, Motor mount can be rotated to 10 different positions, compatible with other brand spurs (Axial, Traxxas, Robinson) Cast Yota Axles Ratio: 15/40 = 2.67:1 Width at hex (using 4mm TF2 hexes): 176.5mm All New Trailfinder 2 Chassis Features - Billet aluminum constriction Adjustable shock hoops Driveshafts High quality plastic material, very durable High quality steel Yokes Wheels Name: 1.55 OEM beadlock wheels Hub: 12mm hex Width: 22mm Back spacing: 9mm Features: Stamped steel, aluminum hub, internal beadlock, very scale looking, 6 bolt pattern, Bumpers Tough Armor TF2 Winch front bumper Tough Armor TF2 Rear Bumper Tough Armor TF2 Side Sliders Authentic looking crawler style tube bumper. Very high quality flexible plastic, very durable, very scale. TF2 Truck Dimensions Wheels base: 287mm (11.3") Width: 215mm (8.5") Height: 210mm (8.25") Ground clearance: 57mm (2.5") Final Drive Ratios: 1st - 62.1:1, 2nd - 22.75:1. 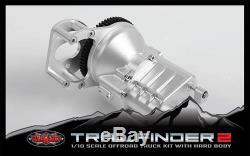 DRIVETRAIN The TF2 includes the new Hammer Transfer Case. Packed with detail, the case features a cast metal exterior and the same new 32P widened gears for durability. The most scale accurate axles on the market, the RC4WD Cast Yota axles feature innovative round knuckles, new lower mounting points and compact offset pumpkins. The All New R3 2 speed transmission comes with a fully machined billet aluminum case and new wider gears to allow for more abuse along with a Delrin spur with slipper clutch. The new designed motor mount is adjustable in 10 positions. Drawing on the success of the RC4WD MOA gear sets, the TF2 drivetrain has the most durable gears RC4WD has to offer so the TF2 will stay on the trail, day after day. The Driveshafts for the TF2 are an all new design featuring bulletproof steel universals and a new high quality plastic shaft for great driveline angles and durability on the trail. 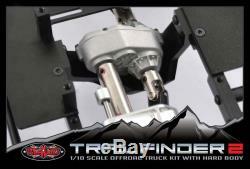 SUSPENSION The TF2 includes a set of RC4WD Ultimate Scale Shocks. Designed for ultimate scale looks and ultimate performance. Machined from billet aluminum, rebuildable and internally sprung. 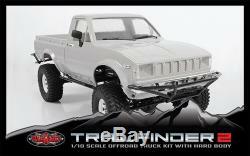 The TF2 includes a set of RC4WD White Stamped Steel 1.55 internal beadlock wheels. Super tough paintable white finish, aluminum internal ring and popular 6 lug design. The TF2 Chassis features a molded fuel cell that doubles as an electronics storage box plus an aluminum, frame-mounted under cab electronics tray for multiple electronics mounting options. 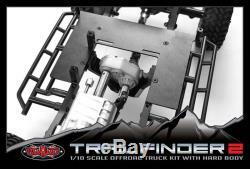 The All New TF2 Chassis is a machined billet alumi- num ladder frame design with leaf springs, scale shock hoops, chassis servo mounts and hard body mounts. Every TF2 needs a tough set or rock grabbing tires and the included Mud Thrashers in X3 Compound deliver the traction as well as perfect scale looks in just the right size. DETAILS The TF2 Mojave body features new late model style square headlights, chrome bumpers and a redesigned shape of the classic 4x4 body style. More accurately proportioned and better details. Another industry first, the TF2 Mojave Body Set includes a bolt on, scale accurate molded cab back with every kit so you can use just the cab for a truggy style build. The Mojave Body Set includes add on windshield wipers, mirrors, marker light details and door handles for the ultimate in scale looks. These items are also easily replaceable if damaged. 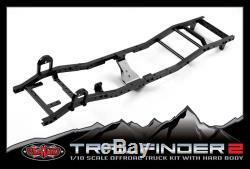 The TF2 Mojave Body Set includes an industry first dropped bed molded directly into the body. 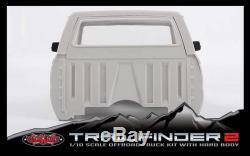 Perfect for carrying all you scale accessories or spare wheel and tire. 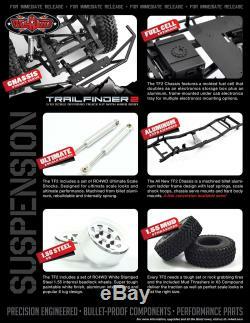 The Trailfinder 2 kit also includes all new scale rock rails plus front and rear tube rock guard bumpers. 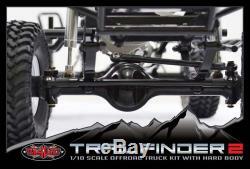 The front bumper has a winch mount built right in for an optional RC4WD winch. 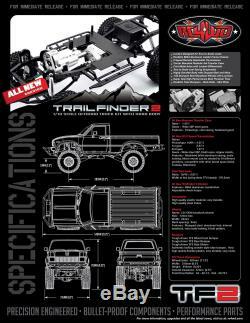 1x Trail Finder 2 Truck Kit w/Mojave II Body Set. This is a kit that requires building time appro. Cross Wrench or Nut Driver. Instant glue / Plastic Cement (prefer non whitening). Radio and Receiver (3 channel or more). 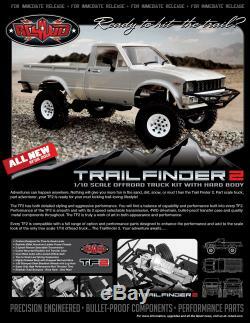 The item "Trail Finder 2 Truck Kit Mojave II Body GREY 4x4 Scaler RC4WD TF2 Z-K0049 chassi" is in sale since Thursday, October 8, 2015. 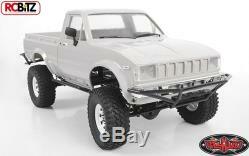 This item is in the category "Toys & Games\Radio Control & RC Toys\RC Model Vehicles & Kits\Industrial Vehicles & Trucks". The seller is "rc-bitz" and is located in Banbury. This item can be shipped worldwide.